This blog candy contest is now closed. Thanks for playing! Today my book "A Year of Flowers" is officially AVAILABLE!! (although I know a few of you have been ordering it already this past week, thank you!) Yippee! Enjoy a year’s worth of stylish card designs with the monthly projects and popular stamping techniques! 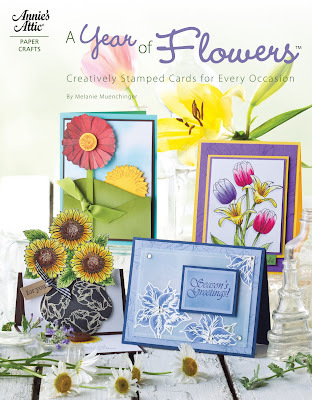 Gina K will be sharing a video on StampTV very soon featuring the book, but you can also find sneak peeks of more of the projects inside on the Annie's Attic site, where you can order both the book AND the "A Year of Flowers" stamp set. Detailed, step-by-step instructions and photos make it easy for crafters of all experience levels to enjoy creating stylish, handmade cards, from very simple to multi-layered designs, using a variety of unique color palettes and layouts. With the built-in dates to remember section, A Year of Flowers will not only allow the card crafter to grow and perfect her card-making skills over the course of the year, she can sit down, plan, create, and get cards out on time! 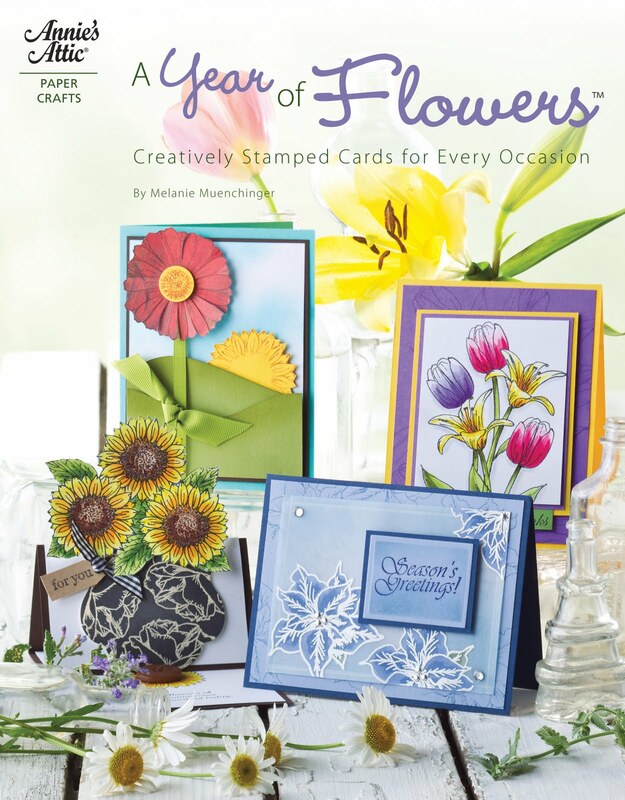 Every card in this book uses my "A Year of Flowers" stamps from Gina K Designs, plus you'll see lots of other favorite products like Spellbinders Nestabilities, Gina K Pure Luxury cardstock, etc! Any other floral images can be used with these designs and techniques, of course, but you can do them ALL with these one-of-a-kind all-occasion stamps. The book is $14.95. You can read more about it, plus an early customer review, in this post. To enter this blog candy, leave a comment below telling me your favorite flower in this set OR tell me which of my coordinating floral sets from Gina K Designs you like best! (Did you buy the book already? I would love to hear what you like best about it!) You can get a second chance to win by linking this post on your blog or Facebook to help spread the word about the book and the blog candy giveaway. Come back here and leave a second comment with the link letting me know you did. Finally, I would love for you to become a follower of my blog so you never miss a post! I regularly share cards and tutorials for my own stamps and our other fabulous sets from Gina K Designs. Get a third chance by signing up as a follower today! I will announce a winner Sunday. If you are visiting my blog for the first time today through the CardMaker blog, welcome! I hope you'll come back often! Please have a terrific weekend! I know I will, have just been floating around from all the excitement and suport! I appreciate you visiting me today and sharing in my good news! Congratulations Melanie! And thanks for a chance to win too. My favorite flower is: Dahlia. That's my granddaughter's name but I liked the flower before. Now I love it. And I'm seeing a lot of companies using it in stamps now too! Guess she'll be getting lots of those on cards! Congrats! I like daisies or the dahlia. I've been following your blog for a long time and always look forward to your wonderful posts. My favorite flower is the gerber daisy. Love them! Soooo very tickled for you Mel! I ordered yesterday and can't wait to get it. AND my sister had to order one too, lol! I want to get you to autograph mine too...Im so bad about mailing...why dont you just come on up here to NE TX?? haha! So happy for you! My favorite flower is the sunflower--they just make me smile and I always plant them in my garden. I am a follower of your fabulous blog! I love all your stamp sets honestly. At the moment I have Holiday Basket, Forever Spring. They are so nice for their unique look. So I'm using it all the time. =) Thank you for a chance to win! I've also published that on my wall on FB. And I'm always your follower not missiing any of your posts. I have so many of your stamp sets. Recently ordered Stately Flowers 1 and 2, have your Holiday Basket and Basket Additions, and Border Bling and Branching Out and etc. etc. Really love the poinsettias. Have ordered your book and it has been shipped. I am a follower so that I don't miss any of your posts. Publishing this on facebook. Thanks for a chance to win and share with someone. I love that sunflower....it's beautiful and so nice to color. Congrats on your new publication, too! My favorite flower in this set is the poinsettia. I have your border set and would be honored to win a signed copy of this set to go along with it. You deserve a big CONGRATULATIONS Melanie. What an accomplishment! Although all the flowers are beautiful, my favs are the poinsettia and the rose, hard to choose between those 2. Congratulations on your new book! I just found your blog through the Cardmaker post and signed up as an e-mail follower. My favorite stamp in this set is the daylily. Melanie Congrats on your book and stamp set that you can purchase also. My favorite flower is the sunflower so beautiful. Thank you for all your inspiration and you are very creative. I saw an add for your new book in another email this morning and thought "I know her!" Congrats on such a wonderful accomplishment. My favorite flower in the set is the rose. Oh this book is just the BOMB! I can't wait to see more! My favorite stamp in the new set is the poinsettia... it's always been my favorite even though it's considered a Christmas flower! So excited to see if I win this book! Sweeeeeet! I'm a new follower of you blog! I've seen your work through Stamp TV/Gina K Designs of course, but for some reason had never followed until now! I came over from Card Makers blog! Congratulations Melanie on your book! I already love your stamps and would love to win this set! My favorite flower would be the daisy. I fell in love with it in West Virginia when I went to visit a friend in college there. It is so simple and yet so beautiful! Thanks for the chance to win a set of these stamps! Congratulations Melanie. The book looks fabulous. My favorite is the Sunflower...reminds me of Summer. Gorgeous stamp set! I've been wanting a versatile floral set like this. My favorite is definitely the rose. My favorite stamp set of yours is the Make a statement & I'm looking forward to when the Pennsylvania set comes out in the Stately flowers! Congrats on the beautiful book. Mel I would be hard pressed to pick a favourite floral set (or any others), I love all you do and have several of your sets with many more on my wish list, including all the stately flowers yet to be released, I even have make a statement and don't even live in the USA! I can not wait to get my hands on your book and will be ordering a second copy and your stamp set later this year for a dear friends birthday, she had a real tough 2011 and I want to make her birthday special this year. Mel, I purchased the book but haven't received it yet! My favorite flower is the marigold/carnation - I think it can be either, depending on how one colors it (you are always so versatile)! Would love to win the stamp set as I will soon have the book! Blessings. It's hard to pick a favorite from your set! For me, it's a toss up between the lily and the poinsettia. I'm so excited for you as your book is officially available for purchase!! Congratulations! All of the flowers are beautiful, but I especially like the sunflower in the top right corner. It may not be a sunflower, but that is what it looks like to me. Thanks for this fun opportunity! These look like they would go perfectly with your Holiday Basket and your Stately Flowers sets, too. I really like the tulip, cause you can always layer them. I am always trying to work with stamps, but i cant seem to make them work, but im keeping an open mind and going to continue to try. Love the sunflower!!! Anything to do with sunflowers makes me happy. I think they're a happy flower. BTW-I've ordered the book but don't have it yet. Can't wait to get it!!! Congratulations! That book cover is GORGEOUS! Haven't ordered it as yet, off to Florida in couple of days, perhaps when I come back! I love that DAISY, I think it was in You've Got Mail,Meg Ryan says they are the happiest of flowers, I believe she is right! They make me smile and I have a ton of Shastas in my gardens, love them! Well done Melaine - love the sunflower in that set, but I also know that the other co-ordinating sets are amazing and totally lovable too! Enabler Alert. Wow. I love that poinsettia in this set. What a gorgeous looking book. Congrats on your new book! It looks amazing. I really like the sunflower and would love to have your new set. Thanks for the chance!! Congrats, Melanie! I just ordered the book from Annie's Attic early this morning and I think that A Year of Flowers is one of my favorite sets. I use the rose and tulip probably the most. Congrats Melanie on your new book and thanks for the chance to win. I love the rose! I have several of your stamp sets and love the Buds and vases set. I am looking forward to buying your book. I know it will be great. Congratulations on your book. It must be very exciting. I love all your sets but as far as flowers go I love the Camilla in the Stately Flowers 2 set. It has so many possibilities. Yay! I am so excited for you Melanie! I am already a follower and have not bought the book yet! I will try to add post to my blog tomorrow! I had a Grand Mal seizure a couple of hours ago and am barely able to send this post. Did not want to miss the opportunity to win and thank you for the chance! If I win, I can afford to buy the stamp set! No pressure here! LOL! Congrats! I love the rose. The book and stamp set are on my wish list. The sunflower is my favorite. I do have this set, so if I won one, I would give it to my best friend and encourage her to order the book----mine is on its way! Book looks like a wonderful item to own!!! In the set, I like the rose the best....so useable all year round....thanks for the chance to win the set (I have others, but not this one...yet)! How inspiring all you do is for me. I wish you continued success and good health to you and all of your loved ones. If I have to only pick one of your flowers, it would be the sunflower. It is summery and cheerful, gives food to birds (and us). Congrats on the book Melanie! Well, you KNOW how big a fan of yours I am! I am going to pick the poinsettia, since I am a Christmas person! I also love the year of borders set, because it also has the shells!! MANY congrats on this book! I WILL be ordering it! Hugs! How exciting for you Melanie...just another really wonderful accomplishment of this great book by a very talented lady!! After just coming on the heels of the holiday season...your poinsettia is beautiful! With this new accomplishment; your holiday season was filled with beautiful poinsettia stampings in and around the home!!! I love lilies. Congrats on the new book. My all time favorite is a Rose. I love the sea side set, nothing beats the smell of the ocean and the warm sun shinning apon you. I love roses and sun folwers. I have yet to see it but, congrats! All of the flower designs are just lovely----but for some reason I am drawn to the "Sunflower". I like all of your past flower designs too. What a blessing to have a chance to own your wonderful book. Congrats. Congrats, Mel! I love, love, love the poinsettia on your stamp set. I used it over and over again on my C-mas cards this year. Thanks for putting this book together. I can hardly wait to order it. my favorite flower is the lily. Wow! How do you pick a favorite when I'm a flower nut. Just love, love, love flowers of all kinds. But if I had to pick a favorite it would have to be the roses I have loved them since I was a little girl. Congratulations Melanie on this fabulous book A year of Flowers. Thanks for giving us a chance to win it! Congratulations on having your book published! A Year of Flowers has always been a favorite set and I love the rose in that set the very bestest! Thanks for the chance to win an autographed copy of the book. I have become a follower too! Sunflowers always grad me. I did find you through the CardMaker's blog and I will be back. Looked around a bit, a like your style. Thanks so much for sharing. WOOOO HOOOOO! super super congratulations! headed back to my blog to post this for ya and then off to order the book! and it auto posts over to my FB page! Melanie your book looks so awesome!! It is on my list! I love your flower sets! My favorite flower in this one is the sunflower! Thanks for sharing! I'm a follower of your faboulous Blog and I linked your post on my Facebook page. Congratulations Melanie! What a beautiful accomplishment. I guess, although loving every flower my favorite is the Rose. Thanks for the chance to have a signed copy! It is such a great book Melanie, I had to go and buy it straight away and it comes as a download too so no postage to the UK! Of course a signed real copy would be even better to drool over! Congratulations, Melanie! I love all those flowers, but I drool over the tulip! Congratulations Melanie!!! I got this set when you first released it and love it. In fact it is my most used set that I have of yours. The poinsettia is my favorite flower, though the rose is a close second. I posted about your blog candy on my blog. Don't count me in the running for the candy, as I already have this set. Melanie you are so incredibly talented, thank you for sharing your talent. How exciting to be published! Congratulations! I have two that are favorites, sunflowers and pansies. Thanks for the opportunity to receive a signed copy of your book! Congrats on your book! It looks beautiful and I'd love to have a signed copy via 'blog candy'. My favorite flower is the ROSE because it's shown at a little different angle than most designs. Usually you see it only from the top; I like the way we see the side view in your design. I have my fingers crossed that I'll win the blog candy!!! Congrats on your book and thank you for all the inspiration!! I found your site from CardMaker. My favorite flower in this set is the Rose. Thank you again for a chance to win your signed stamp set. Oh, I love A Year of Borders. I love to color these! I'm so excited about your book! Congratulations! Mmmmm it's a toss up for me.. Either the rose or the mmmmm waterlily (? The one to the left of the rose) are the 2 I use most. I love arranged with love too!! (and all the other ones). I use a year of leaves most with this set though. I'm sure you know this but for the record I am of course a follower!! Congratulations Mel! I am so excited for you and I can't wait to get the book! My favorite flower in the set is the sunflower - I just love autumn :) Thanks so much for the opportunity to win! Congrats again, Melanie! I think my favorite flower in this set is the sunflower. I have this beautiful set but if I am lucky enough to win, I will give it to my friend. Thanks for the chance to win! Love the stamp set, especially the rose. Thanks for the chanch to win! How exciting for you Melani! Congratulations. This set is one of my first sets from Gina K. :) It is so versatile. It's a beautiful stamp set!!!!! Congrats on the book!!!! You are so talented!!! Hard to choose a favorite flower but the sunflower is gorgeous!!!! I just love those Lady bugs too!!! Mel, my favorite coordinating set is...Pressed Flowers! For those of us without copic coloring skills, it's great! I'm now a follower, Melanie. I never think of this. I just try to remember each day who I need to look at. Following is so much easier! Just wanted to Congratulate you, Melanie, for your Awesome Book!!! I can't wait to see it, and I'm sure it will be SO fabulous. You are a wonderful, talented illustrator and cardmaker and now you have your own book! I'm just SO happy for you!! Congratulations!! Congratulations on your book. I am a newer follower and am desperately trying to go back and "catch up" on all the wonderful projects and techniques you have posted. Your talent is amazing. Stately Flowers 2... Visiting Alabama! My BOOK: "A Year of Flowers"!